Resicast makes the only 1/35 scale Para Stretcher Team I know of and contains 3 walking paratroopers carrying a stretcher case. This set has been around for a long time, but for those unfamiliar with it here is a look at what you get. Packed in the standard Resicast zip plastic bags, it comes with a paper insert depicting the finished and painted Stretcher Team. Each individual figure is packed within its own small zip bag, and included with the set is an A5 foldout showing the built team and 3 separate pictures of the bearers. The set is cast in a light cream resin and appeared free from damage or air bubbles. All the stretcher bearers are upright walking figures that appear to have fairly natural stances. 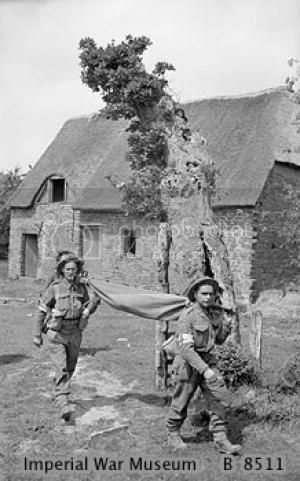 The stretcher is carried by two front bearers (paratroopers) followed by one individual holding the rear of the stretcher in the form of an airborne medic. The figure comes in 4 main parts, the body cast as a whole, with head and arms being separate. Dressed in Dennison Smock and standard paratrooper trousers, as with all the Resicast Airborne troops I have looked at, he is highly detailed. The smock, sculpted open at the neck, is well represented with the correct buttons and studs. On the rear of the smock is the dovetail, but this one seems to be missing the 2 small studs that held it up. The right hand lower pocket is closed, but bulging with some kit whilst from the left hand lower pocket a folded paratrooper beret protrudes. Trousers, ammo boots and anklets are all well sculpted. Over the smock the trooper is wearing a full set of 37 pattern webbing, including left and right ammo pouches, 37 pattern web belt from which hangs a short stabbing bayonet on the left hand side. On the right hand side is slung a canvas type water bottle. All the brasses, buckles and straps are extremely well done through the webbing. The arms come separately and the right arm is designed to be attached to the stretcher with the carrying handle in place in the right hand. The left arm carries a Mk V Sten gun by the lower grip and rested into the arm. Point to note: the picture shows the magazine attached to the right hand side of the Sten but this should of course be attached to the left hand side. The head, also a separate item, has the face of a determined young man. The facial detail is excellent and he wears a paratroopers helmet with netting and camouflage and has the appropriate chin strap. Additional equipment included in this bag was the magazine for the Mk V Sten Gun, 3 x respirators (which by the way are really good representations of the actual kit), and 3 x digging tools. I’m sort of warming to these tools as the detail is quite good. This figure comes in 5 main parts, the body cast as a whole, with head and arms being separate as is the right hand which holds a rifle. This figure is also dressed in Dennison Smock and standard paratrooper trousers. The smock is well represented with the correct buttons and studs and is sculpted open at the neck. On the rear of the smock is the dove with the 2 small studs. Both left and right lower pockets are bulging with kit. Again the trousers, ammo boots and anklets are all well sculpted. 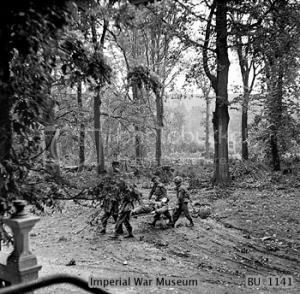 The arms come separate with the left arm designed to be attached to the stretcher with the carrying handle in place in the left hand. The right is designed to carry a No 4 rifle which comes as a separate item with the hand attached. The rifle is a good representation of the weapon. The separate head has the face of a young man. The facial detail is excellent and on his head he wears a paratroopers helmet covered in netting and slightly tilted slightly to the left. Another excellent face, again the appropriate chin strap is in place. The figure comes in 5 main parts, the body cast as a whole, with a choice of 2 heads and the arms being separate. Once again, this figure is dressed in Dennison Smock and standard paratrooper trousers and is highly detailed. The smock is well represented with the correct buttons and studs, it is sculpted open at the neck. On the rear of the smock is the dove tail but this one seems to be missing the 2 small studs that held it up. The right and left hand lower pockets are closed but bulging with some kit. Over the smock the trooper is wearing a full set of 37 pattern webbing, including left and right ammo pouches, back pack and 37 pattern belt. On the right hand side is slung a water bottle, and on the left hangs a medical haversack. All the brasses, buckles and straps are extremely well done through the webbing. The arms come separately and both are designed to carry the load on the rear of the stretcher with the carrying handles being in place in the hands. This time you get a choice of two heads, the first bearing the face of a proud young man and wearing a beret. The second head shows the face of a wounded soldier with a bandage across the right eye wearing a paratroopers helmet with netting. Both heads are excellently done. The stretcher case comes moulded as one part, with the wounded soldier moulded to the Para type stretcher. The figured is dressed in Battle dress with the right trouser leg ripped open and the material lying behind the leg, the lower part of the leg being covered in a bandage. The figure has his left arm resting on his stomach and his right arm resting by his side on the edge of the stretcher. The battle dress is open at the neck showing a shirt below, and the top right breast pocket is bulged out. The head is well done with an excellent face and the head rests on a rolled up blanket or ground sheet. The paratroopers stretchers were of a folding type and the fixings for this are evident on the sides of the stretcher. Only the pour stub at the top will need careful removed and the stretcher is nicely detailed underneath. It’s amazing to think that these figures were modelled 10, 12 or more years ago. The detail and thought that has gone into the presentation of the kit and uniforms is just brilliant. Highly accurate and detailed, each figure is a pleasure to view. The set would make a good stand alone build or could easily be incorporated into a larger diorama. From the beret stuffed into the pocket to the small brasses on the pack straps, these figures just ooze personality and an attention to detail that is rarely found even now. I particularly liked the wounded head. If there is a down side it is my limited ability as a figure painter to really do them justice. Fixing the stretcher to the 3 bearers might be tricky, but that was the moulding style back then. 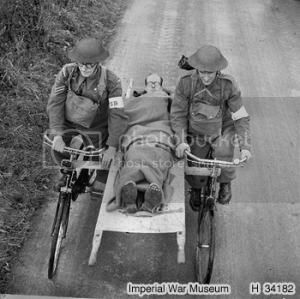 Wounded soldiers and medics are rare for 1/35 scale British/Commonwealth troops in WW2. A couple of walking wounded would be a great addition as would the odd doctor or orderly. A build blog has been started Here on the Forums. My thanks to Resicast for the review sample. Highs: Beautifully sculpted, casting of the highest quality and a unique set in its presentation.